The early explorers brought Longhorn cattle of Spanish ancestry to the island settlements in the "New World" In 1521 Cortes stocked his Mexican Ranch with cattle from the island settlements Cuba and Santa Domingo. In 1541 Coronado seems to have brought the first cattle from Mexico to the area that is now Texas. LaSalle planted cattle on what is now Texas near Lavaca bay, literally meaning The Cow Bay, in 1685, DeLeon brought cattle to what is now Texas on his four expedditions from 1687 to 1690. Subsequent expeditions spread the cattle herds even farther across Present-Day Texas. The two previous paragraphs talk about how this Longhorn cattle population arrived, however nothing extensive was done with the Longhorn cattle population until after the mid-1860's when the U.S. Civil war had left cattle herds decimated and the Texas fever tick plauged cattle drives of the day. 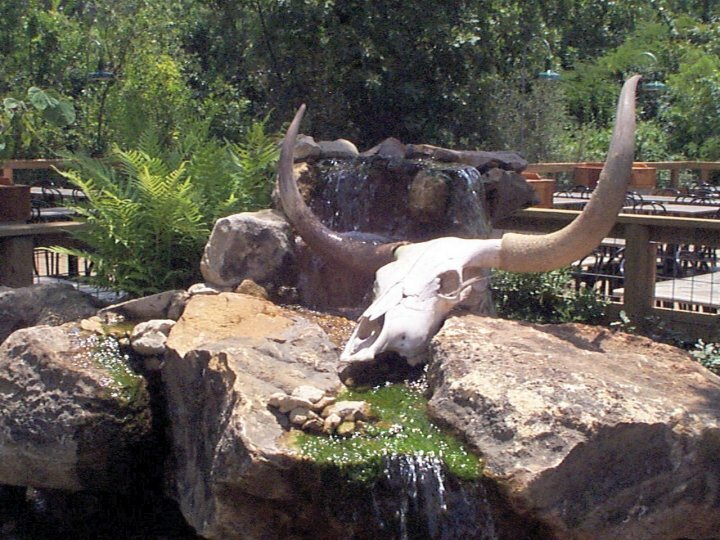 The Texas longhorn could survive the long drive to Abeline, Kansas for sale and also was seemingly immune to the bite of the fever tick. The immmunity to the bite of the fever tick seemed to have developed over the generations and was a genetic trait in the herds of that time. 1. The MIlby Butler- started with cattle rescused from shipment to Cuba by way of the family owned stock pens in League City, Texas. The original herd included duns from the Gulf Coast and white cattle with colored points East Texas. 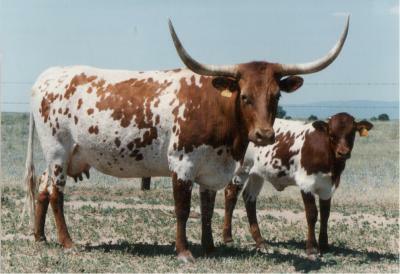 Butler had up to 600 head of longhorns which are unique in several ways. These cattle are bred for horns. The cows were carefully selected and but with bulls he thought would produce lenght, base, and corkscrew shape in the horns of the offspring. 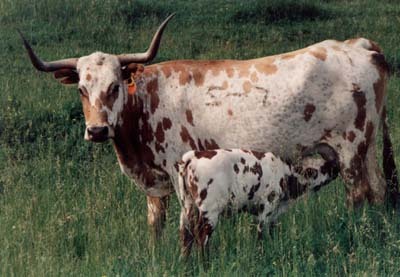 Butler cattle possess several unique skeletal differences including topline, tailhead attachment, "crocodile eyes" and colors not found in other families of longhorn. 2. The M.P. Wright- begun in the early 1920's as Wright selected out cattle that were brouhgt to his slaughterhouse. Pure Wrihgt cattle lines are very rare today, and probably the most distinctive of the seven. The herd was nearly all duns, reds and line-backed, long in body but not espically tall. They share with their ancestors a tendency towards long, well-shaped horns. 3. The Emil Marks- becoming very rare, found its beginnings on Mark's Barker Ranch just west of Houston, Texas. 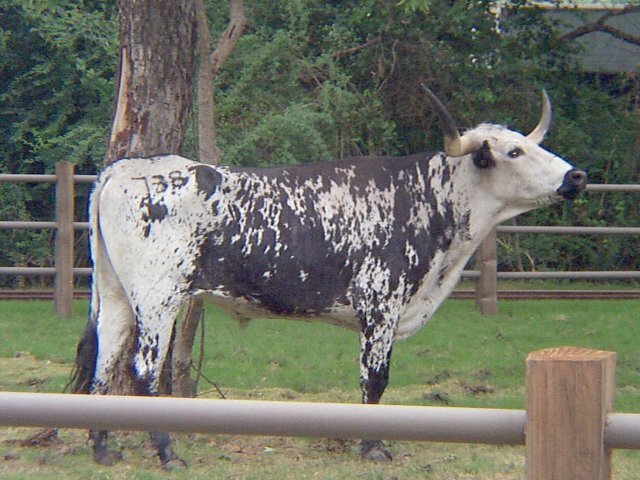 Marks valued the traditional functionality of the Texas Longhorn, and the Marks line contributed much of this to the present breed. When asked about what makes a good cow, Marks would reply "A good cow has a good long body, a long hip, she stands up, she can travel and she has good legs. She has a calf every year." 4. The Cap Yates- originated mostly from west Texas and Northern Mexico where "survival of the fittest" is a daily reality. Cap Yates strongly believed the purity of his longhorns was of utmost importance. They are generally beefier and larger-framed with relatively shorter horns. Horns are typically fairly "high" with an upward twist second to none. The other dominant characteristics of the Yates are ruggedness, good survival instincts and an independant streak. 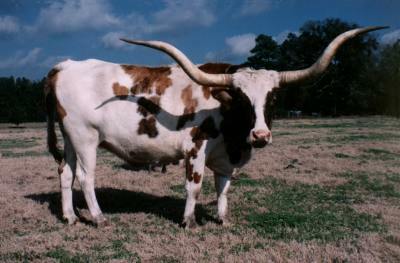 This breed really eximplifies the spirit of the Old West, what all Texas Longhorns truly stand for. 5. The Wichita Refuge- mostly from West Texas and northern Mexico with additions over the years made from the Cap Yates herd or Mexican cattle from Clower. This breed lives on the Wichita Mountain Wildlife Range, found in Oklahoma. The Refuge mandate is specifically conservation of the traditional Texas Longhorn. 6. The Jack Phillips- began on the Battle Island Ranch near Columbia, Texas. Jack learned a great deal from his frind, Graves Peeler, who brought him some cows and one of the dun-colored bulls he had found in Mexico. They all had pretty good horns and were big cattle. Throughout the 1930's Phillips accumulated more "typical" longhorns from area ranchers. He looked for long-bodied, long-headed cows with a high tailhead and a tail with a heavy brush dragging the ground. Jack also liked the old Texas-twisty horns. 7. The Graves Peeler- reflects the characteristics of the man who started it. 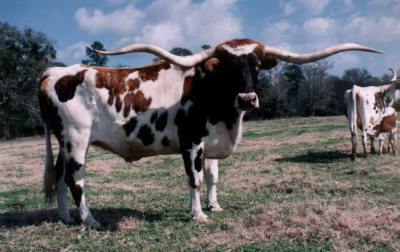 Peeler a true legend among Longhorn breeders, choose his cattle more for "personality" than any one physical attribute. Peeler liked his longhorns tough and independent, and did not object if there was a little wildness thrown in. Also important was productivity- a cow that failed to calve was not bound to stay long. Physical Description:At four years old weighing 800 pounds (365 kg), maturity at 8 to 10 years old. Height 60" at shoulder, Length up to 100". There are various colorations present in the Longhorns. General Information:The Longhorns live in herds consisting of males, females and their progeny. Special anatomical, physiological or behavioral adaptations:Resistant to ticks and able to travel over 1,000 miles (1600 km) feeding along the way, described as "a wild fierce breed with huge horns and long legs. ", Body with a long and slender build, tucked up flanks, catlike hams, and a thick tough hide. Personal Observations: These are cows a somewhat calm and persistent animal. Longhorns have no real problems in the wild besides predatory animals and the avoidance of habitats in droughts or frosts with inadaquate forage to support a herd. These problems are often offset by a rancher or farmer providing for the animal.